Description: If you’ve ever wanted to stay in an authentic pre-Civil War cabin, here is your chance, in our Virginia honeymoon cabin! Take a load off, as they say, and come sit for a spell overlooking our gurgling mountain stream as it winds its way down towards the river. The wooden porch swing on the back deck is the perfect vantage point to enjoy quiet togetherness with that special someone. You’ll find time moves a bit slower here, giving you a chance to unwind from the hectic pace that today’s world demands. 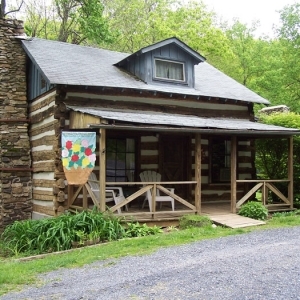 Cabin Logwood was built in a slower time by Confederate Soldier William Tolley for his lovely bride before heading off to that awful conflict known as The American Civil War. Sadly, Tolley never returned, but has the distinction of finding his end in 1863 in the same battle that mortally wounded General Stonewall Jackson, the Battle of Chancellorsville. Tolley’s cabin was destined to live on, however, moving on to fulfill new and exciting dreams that were different from those first envisioned by Tolley and his bride. While a good stretch of the cabin’s history is a bit faint, our story picks up when George and Dorothy Stein, affectionately known to friends as Sonny and Bunny, discovered a classified ad that the cabin was to be given away. All that was required was for the recipients to move it! Sonny and Bunny, with the help of their two children, tackled the project with gusto, fulfilling their dream of opening a country craft shop beside their home in Love, VA. They spent two years numbering the logs, dissembling the cabin, trucking it the 50 miles from Goshen Pass, and reconstructing it at its current location, finishing up in 1978. Most of the logs are original, although a few had to be replaced because of excessive deterioration. The cabin was modified a bit, by raising the roof slightly, enlarging the front and rear dormers, and adding a front porch. Thus began the history of Mountain Blue Crafts. Sonny Stein made pine furniture and electric clocks, Bunny focused on dolls, needlework items, and tole painting, local artists brought their wares, and Mountain Blue Crafts was open for business. Fast forward to 1995. Sonny had passed away a few years earlier, and Bunny was finding it more and more difficult to keep up with the place. So she sold the cabin, along with her house and garage and the 2.5 acres that they were setting on, to Stan & Deb Horst, the new owners of Cabin Creekwood. Stan & Deb, with the help of a local contractor, installed some upgrades to make this a rental cabin suitable for overnight guests. First, they closed in part of the back deck to create a bathroom, outfitting it with an antique cast iron clawfoot tub, perhaps one very similar to what your ancestors used. Next they added a few cabinets, a stove, and a refrigerator in one corner of the main floor to create a kitchen. And thus was born Cabin Logwood, providing guests from all over the world with the unique opportunity to spend a night, a weekend, or a whole week in the same cabin that William Tolley and his bride enjoyed. And judging from the response, it has brought new life to this old cabin, as Cabin Logwood has consistently been our most rented cabin every year since! This Civil War cabin itself will accommodate four people quite comfortably, with two double beds located in the upstairs loft bedroom. On the main level, you’ll find comfortable furniture, and the above mentioned kitchen and bathroom. You can relax on the back porch watching the creek and looking for wildlife, or hang out on the front and watch the few cars go by as they make their way toward the Blue Ridge Parkway. 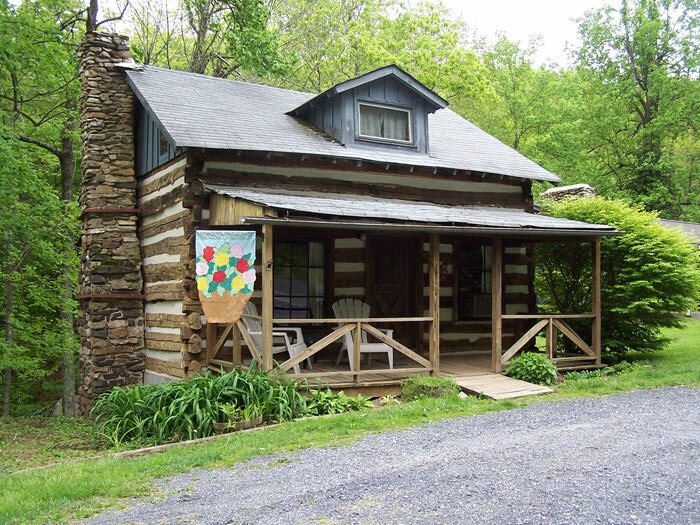 Speaking of, the BRP is just 1 1/2 miles away, so this is a perfect place to experience the great outdoors in addition to the history of the cabin. You can go for a short stroll or a longer hike on one of the many trails along the BRP, or simply drive a ways and look for wildlife. While you’re on the Parkway you might as well head north to the Appalachian Frontier Farm located at the Humpback Rocks Visitor Center. This is a free bit of additional history with a self-guided walking trail. During the busy seasons you’ll find costumed workers to visit with and learn more about life back then. Want to hang out at the cabin? Throw some steaks on the charcoal grill and put some foil-wrapped potatoes in the coals. There’s nothing quite like a good meal cooked over a fire. You’ll actually find two grills at Logwood. One is by the cabin for convenience. The other is down by the creek, next to your very own fire pit and picnic table. Speaking of fires, not only can you relax around a campfire outside, but if the weather is a bit chilly, cuddling up in a blanket next to the indoor rock fireplace makes for a very peaceful evening. If you need a little entertainment, you’ll find a flat-screen TV and DVD player. We don’t get any channels here, but we do have a decent selection of family-oriented movies that you can check out at the office. Or you can bring your own. Cabin Logwood is located on 2 1/2 acres with two other cabins of ours. Oakwood is a three-bedroom bungalow just to the right of Logwood and separated by a grassy yard, and beyond Oakwood is another one-bedroom called Barnwood. Although each cabin can be rented individually and most folks tell us they don’t feel crowded at all, their proximity to each other make it a perfect group to rent if you have more people. Together, the three can accommodate 16 people quite well. Whether you’re into hanging out at the cabin or exploring the local attractions, this very special Civil War cabin for rent lets you take a step back in time 150 years, and experience for yourself a bit of what life was like. Rates vary depending on day of week and time of the year, with weekly discounts available. To see rates, enter specific dates or click on the little calendar above. A deposit of 50% is due when making the reservation, with the balance due upon arrival. Pets are permitted for a fee of $12/pet per night. Check-IN is anytime after 3pm. Check-OUT is 11am. Cancellations with at least a two-week notice will be refunded, less a $10 cancellation fee. Cancellations with less than a two-week notice will forfeit the deposits. No-shows and Cancellations with less than a 24 hour notice will be charged the remaining balance of the full reservation.